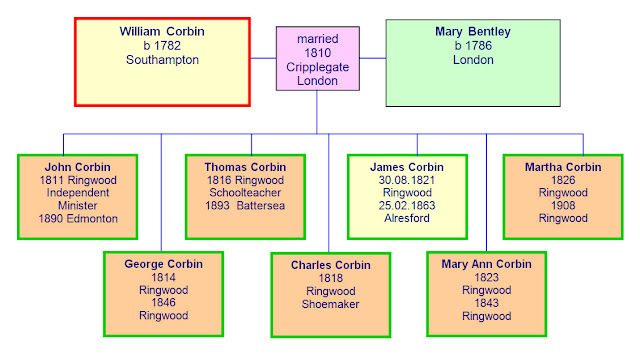 This is the story of James Bentley Corbin who was born in Ringwood, Hampshire in southern England, in 1844, and who emigrated at age 17 from Alresford, Hampshire to Australia in 1861. 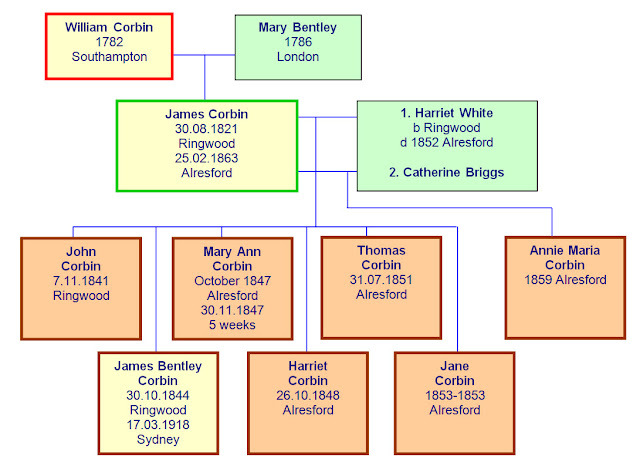 We now know that the unusual middle name 'Bentley' was taken from his grandmother's maiden name, for in 1810 William Corbin of Hampshire married Mary Bentley of London at Cripplegate, London. They raised a family of seven in Ringwood. Their eldest child John has descendants now living in South Australia. Their fifth child James, born 1821, married a Harriet White - James & Harriet's second son was James Bentley Corbin, born 30 October 1844. 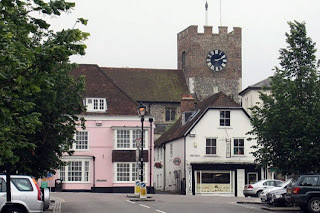 After young James was born, James & Harriet moved their family across Hampshire to the town of Alresford (pronounced "Allsford"; also called New Alresford). Four more children were born after they settled in Alresford. In 1852, with young James only 8 years old, his mother Harriet died, aged just 31. At this time the family were living in East St, Alresford. James senior remarried in 1855. Perhaps this was one reason for young James' departure. Also, with the gold rushes of the 1850s, Australia had for the first time become a land of opportunity, especially to Britons toiling through the Industrial Revolution. It may have had irresistible appeal to one young man looking to build a future for himself. Uncle Jim, as my mother calls him, left England as a very young man, with my grandfather [James' elder brother John] seeing him off. Letters passed fairly frequently, he wrote very often to his sister Harriet, also sending a photo of himself and house in Sydney. So far, it is not clear what ship brought James out from England. It is thought he worked his passage on the crew, perhaps utilising skills in working timber passed down from his cabinetmaker father. On arrival in Sydney James turned to a living he knew. 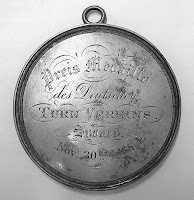 He obtained employment with Maurice Clancy, cabinetmaker, of Elizabeth St, a few doors north of King St.
Clancy had his business premises and also his residence at this Elizabeth St address, which was not unusual in the Sydney of that time. Within two years of James' arrival in Australia, his father back in Alresford, James senior, was dead at 41. 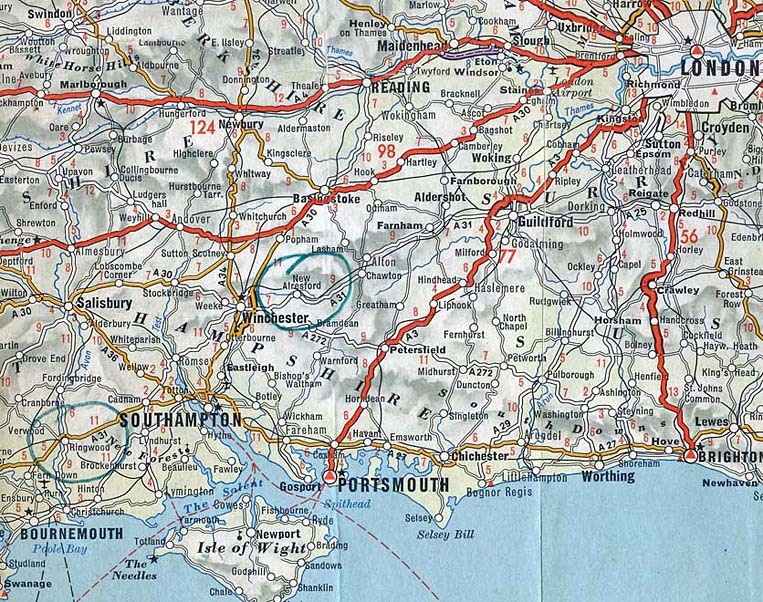 One imagines that, with both his parents now dead, James' thoughts may have focussed exclusively on the future, rather than thinking back to the old country. 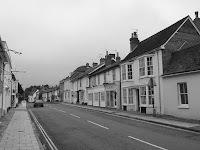 But there was room for sentiment - when James later established himself and his family in a nice house in Sydney he called it 'Alresford'. In 1867 a property became vacant in Castlereagh St directly behind Maurice Clancy's place in Elizabeth St. Perhaps this opportunity spurred James into action. James left Clancy's (they were still on good terms) and took up the Castlereagh St property. In October 1867, James and others signed a contract with the city council for repairs to the engine house at the Lachlan Swamps (which was Sydney's water supply at the time and is now Centennial Park) - by then he was 'James Bentley Corbin, cabinetmaker, Castlereagh St'. Corbin and Nicolle, carpenters, 170 Castlereagh St.
James' business partnership with Phillip Nicolle was a solid one. It lasted for decades, through good times and bad, and only came to an end when Nicolle died. Also in 1868, James, now aged 24, married Maurice Clancy's 18 year old sister, Margaret Mary Clancy. The date was 11 May 1868. Although he was of the Church of England, James wed Margaret at the Catholic Church, Concord. The Clancy family were Irish Catholics based at Concord. Witnesses to the wedding were Phillip Nicolle and Margaret's sister Mary Ann Clancy. At which point we will divert from James' story to talk about the Clancy family (see next page).